Annabelle along with many more death eaters apparated onto a large coucil estate in muggle London. All of them dressed in their Black Death eater uniforms. The sun had already set above the houses in the distance and the darkness was creeping over the sun soaked sky. Annabelle stood gazing around at the strange surroundings, along with Charles who stood by herside. "Ready??" She reached for her wand, and looked around once more. She could only see a gang of chavs walking up the street in their hoddies and tracksuit bottoms. The tallest out of them started shouting. "I DIDN'T KNOW IT WAS HALLOWEEN! WHY YOU DRESS LIKE THAT??" He turned around and laughed with the other yobs. Annabelles anger grew with every word he spoke. "That one's mine!" She whispered. Finaly the darkness crept over. Suddenly all the street lamps started flickering and a cold wind blew through. She nodded and started walking towards him. She walked even closer to the young man, and with every step she took the more abbuse came flying her way. "I'm going to make you wish you weren't born!" She aimed her wand at him and let angry thought run through her mind. "CRUCIO!" The boy fell to the floor screaming, whilst Annabelle stood and laughed. "Halloween did you say??? Well lets just say that I'm your worst NIGHTMARE! CRUCIO!!!" She laughed even harder as the boy screamed for mercy, but she wouldnt give it to him. She turned around and watched all the green lighs flying past, and wached Charles. Oh how she loved it when he was attacking people. Charles watched as a panic had arisen. More killing curses exploded out of his wand killing stray pedestrians. The killing continued he waited for a resistance to come. Surely these muggles would try to fight back Some man down the road yelled a dirty word at Annabelle. Charles appariated right in front of him. "What muggle?" He roared the man's face turned pale. "Sectumsempra!" He called and the man's face exploded into rivers full of blood. Charles looked down "CRUCIO! CRUCIO! CRUCIO!" The man siezed and screamed in pain until he died. Screams filled the air and bodies and blood covered the floor. The sky was no longer dark, it was a ray of greens and reds. Annabelle stood laughing, her eyes filling with the reflection of green. "AVADA KEDAVRA!" The boy fell lifeless onto the cold floor. She turned around and noticed another death eater kill another muggle who was shouting. She instantly recognised it as Charles, due to his constant urge to kill anyone who gave annabelle grief. "Thanks." She smiled although the smile could not be seen through the mask. Annabelle nearly fell to the floor with laughter. "Oh god!! These muggles are so dumb!!" She disapeared for a moment then reapeared in front of the car. One policeman was sitting in the front seat alive, but shaking with fear. "Awwww i think he's scared!!" She laughed even more and he reached for his gun. "ACCIO GUN!" The gun flew into her hand. The policeman simply stared. "I've never tried uding one of these before." She pointe it at the mans foot and pulled the triggor. He yelped with pain. "Nah i like my spells best! INCENDIO!!" The car filled with flames and the man screamed. Annabelle apparated back to the spot where charles was standing. "Nice" He turned to Annabelle. "I love girls that can kick arse!" He laughed and then cursed several more people. He could see more police cars flying by. "You gotta love em!" Charles called. "INCENDIO!" Making a blazing wall of fire stopping the cars in their place. She simply smiled and wached the cars blow up in smoke and flames. She smied coldly whilst listening to the screams. More and more people could be seen trying to run away, and that ment that more and more people were being killed. "AVADA KEDAVRA!!!" A young girl fell to the floor limp. Charles stood amongst the destruction and flames. He laughed a high laugh, a cold laugh. Charles looked to Annabelle. "I hear the Prime Minister is in town. Want to pay him a visit?" How annabelle loved seeing so much destruction being caused in so little time. She stared at Charles for a second, then answered his question. "The priminister?? Well well well....He will be shocked. Lets go." Charles looked at the Death Eaters that were causing destruction, "We will be right back," Charles grabbed Annabelle's hand and together they apparated to a nicely decorated room. A man sat at a square brown desk. When they popped in the man leapt backwards fallign on his back. Charles laughed a little, "Are you the prime minister?" He asked. The man studdered slightly, "Y-y-yes, who are you," Charles pointed his wand at the Prime Minister but "STUPIFY!" A red light hit him in the chest. He fell back breaking in the desk and hitting his head on the edge. Warm blood trickled down from above his right eye. Charles looked for his wand but it was across the room. ACC..." But another stupify caught him in the side and sent him into a wall. Annabelle laughed as the priminister fell, but she suddenly stopped when charles was hit in the chest. She turned around to face a couple of aurors. She screamed slightly, but then she remembered how they had attacked her nephew. Anger grew inside of her. "AVADA KEDAVRA!!" She screamed and wached it hit one in the stomach. Another auror shouted from the back of the room "STUPEFY!!" Annabelle had to act quickely. "ENERVATE!!" The counter spell wizzed into her mind. "AVADA KEDAVRA!!" Another auror fell to the floor. Charles inched over "ACCIO WAND!" He called out his wand snapped in his hand. The room was spinning and he sumbled he pointed his wand at the auror. The auror looked familiar like the one he had killed in the woods. It could have been his brother. Charles head throbbed from the concussion. He pointed his wand out AVADA KEDVRA!" The killing spell missed. "CRUCIO!" The auror roared out and it struck Charles. He fell down and began to seize on the ground in pure agony it felt like his inside was dying. Blood poured from his mouth, through his mask and onto his robe. He tried to grab his wand but couldn't lift it, Charles had lost too much blood. So he lye there for several minutes that felt like an eternity. Annabelle screamed as Charles was hit once more. She had to do something. "FINITE INCANTATUM!!" Her anger was at a boilng point by now, she could feel her blood boil deep insie her. "AVADA KEDAVRA!!" Finaly the last Auror fell to the ground. She sighed with relief but then remembered about charles. She rushed to his side and fell. "CHARLES!!" She took off his mask and tapped his face. "CHARLES!! ANSWER ME!!!" All she could see was blood. Blood everywhere. "FERULA!!" Banages flew out of her wand onto her robe. She aimed her wand at them and shouted "AGUAMENTI!!!" The bandages soaked in water, and she placed them on his mouth and his eye. She held his hand. "Charles???CHARLES??" She wept as he lay bleeding. Charles struggled and lifted his wand, he was shaking still in agony. He inched over to a window pulling himself over. The window was over and threw it he could see the destruction of the city. "Morsmordre!" He choked and the dark mark appeared high in the sky. Then he fell back. Charles looked at Annabelle, "Th-thanks,"Then he fell back unconscious. Annabelle watched him fall. She ran up to him and with every ounce f energy she had, she tried to lift him up. "Charles look at me!!!" But it was no use he was unconscious. She grabbed his arms and apparated back to the council estate. She had no idea what to do. She looked around for the others. There were still a phew there. One lept over to them asking what had happened. Charles regained consciousness for several minutes. He looked into Annabelle's eyes, "I'm sorry, I'm weak," He choked on the blood. "Let's get out of here," Then he fell asleep once more. Annabelle gazed down at him and smiled. "You're not weak...you were caught off guard!! Where can we go tho???" She lifted his head up and wiped away the blood from his face. He coughed and turned over and spit out more blood. "How bout the woods, it may be on Hogwarts ground, but it' safe." Charles threw his head back. She placed his head on her lap and wiped more blood away from his mouth. "Ok." Annabelle held him closer and apparated with him into the woods at Hogwarts. It was dark and dingy but at least it was safe. Harry had been walking down the road, when he stopped, the street lamps had gone out and he felt a cool breeze brush over him, rufferling his hair and reavealing his scar he sttod still for a few miniutes as his eyes darted about, he saw nothing, he heard scream of people what seemed to be near by picking up his feet he jogged in the direction of the noise, he slowed to a stop as two figures apparated away, a breath caught in his throat, there where masses of bodies laying motionless as blood pooled about the place , walking slowly his eyes moved over the boides in desprete hope for any life in any of them. 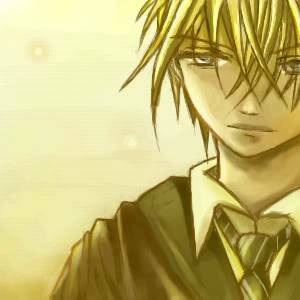 "m-men or w-woman..came..killed..everyone..friends dead...everyone..gone.." Harry listend and sighed Death eaters he was sure of it he didn't know who but he had a hunch, turning to the muggle boy he said "i want you to go home, right away stay in your house and don't come out till it's safe..okay?" the muggle nodded and scrammbled to his feet then dissapeard of into the night. Getting to his feet Harry looked around , he couldn't see anyone all of a sudden his scar eruppted in pain causing him to stumbble and clutch his scar, gritting his teeth in hope not to let out a shout of pain, he looked up and there against the blackend sky, he saw the Dark Mark glowing eerily, he stood for a while as he watched the snake slither out of the skull. Jasmine apparated to the middle of muggle London. She was wearing her Death Eater robes but, she wasn't wearing her mask or her hood. She could smell the foul stench of death all around her. Jasmine drew out her wand and walked around looking at all of damage. She spots Harry standing in the middle of it. Jasmine ran out to him with her wand still drawn,"Harry!!!!!!!!!! Harry, what happened? Are you okay?" Annabelle apparated back to the dark and dim council estate, still in her death eater robes and mask. She gazed around and saw even more bodies lying on the floor, lifeless. A sence of pleasure ran through her vanes as she walked past them all. She hissed at the sight of two human outlines standing around the corner, very much alive. She hissed once more and glided accross the ground. As she moved closer their faces became clearer. It was Jasmine and Potter. "POTTER!!" She gave out a cold laugh and raised her wand, but couldn't bring herself to attack him, no matter how angry she was.